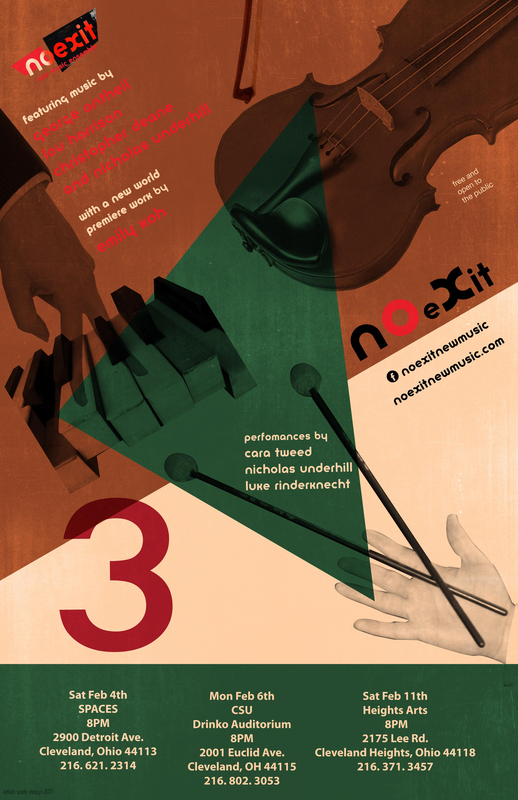 Please join No Exit at Cleveland State University’s Drinko Recital Hall for an intimate and extraordinary evening of music which will shine the spotlight on three of the ensemble’s musicians: violinist Cara Tweed, percussionist Luke Rinderknecht and pianist Nicholas Underhill. These virtuosi will be performing as a group and as soloists, bringing to the table the engaging performances that you’ve come to expect from No Exit. Included on the program will be music from early American avant-garde composer, pianist and inventor George Antheil as well as pieces by Lou Harrison, Nicholas Underhill, Christopher Deane and the world premiere of a new work created by Emily Koh. Free and open to the public.